Ralph Souquet was born in Eschweiler, Germany on 29 November 1968. In the 9 ball pool world he is often known by the nick name: 'The Kaiser'. Souquet started playing billiards from the age of six mainly in his parents pub-restaurant and practised very hard in his early years winning his first German junior championship title at the age of 14 . In the year 1997, Ralph was awarded the 'Silver Laurel Leaf' which is the highest official award or distinction given to a sportsman or woman in Germany. This was presented to him by the German president no less. In his illustrious career, Ralph Souquet has managed to win more than 200 tournament titles and these include at least 40 German titles and more than 32 European championship titles. His style of play is characterised by methodical shot-making and tremendous concentration. Souquet narrowly missed out on winning the 2006 WPA men's world 9 ball championship in the Philippines losing out to Ronato Alcano by 17 to 11. He did however manage to win the World Pool Masters Tournament in June 2006 making him a five times winner! 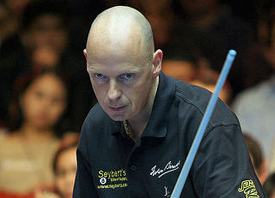 Ralph Souquet is very frequently a member of the Mosconi cup team representing team Europe.